Sometimes, you may want to remind yourself some important things, by a formal way, such as email. Now, I introduce one of our software AMSSE to you, it’s designed for sending a reminder email exactly! It looks like a shareware, but for sending a reminder email purpose, it’s a freeware really. Why? Because the free edition can send 16 reminders per month, and a reminder can contains any number of receivers! Step 1: for sending a reminder email, you need to download, install and run it first. Step 2: create your email account to send reminder email. For a skilled Windows user, it is easy, especially, the users which have used an email client. For the beginners, if you use Google or Microsoft mail, it is also easy, just need to input your email id and password. If use other email service, you may ask your system administrator or the email provider to know the email account settings, or read their help documentation. Still cannot finish? Easy, Google it, such as Google "mail.ru SMTP settings". You can also add some regular reminders, such as monthly reminder, weekly reminder, etc… Also, reminding more people is supported, just fill them in [To], [CC] or [BCC] fields as you wish. That’s all, and please note that following this purpose, AMSSE will run automatically with Windows, so, do not worry about lost your reminders! 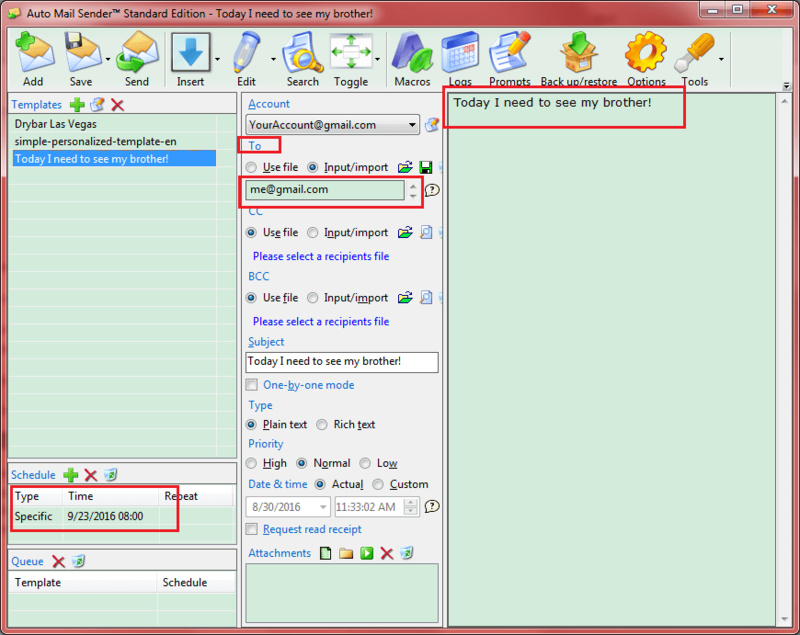 Download our Software to FREE Send Reminder eMail!